Local Landcare groups hosted a sell-out forum in Yass last month to discuss how rural communities can and are making a difference to global warming. Over 220 farmers, students and politicians heard from a great line up of speakers, including Monaro farmer and award-winning author Charles Massy, Ngunawal elder Wally Bell, climate expert Bradley Obdyke, internationally renowned soil scientist Christine Jones, and local mentor and inspirator, Siwan Lovett. It was no surprise to the Landcare organising committee to get such a large turnout to this event, not only because of the calibre of the speakers but of the growing interest and desire in the Landcare community to take action on climate change through regenerative agriculture. Guest speaker Charles Massy describes an ‘underground revolution’ sweeping through rural communities that are moving away from sustainability, which is about maintaining systems without degrading them, towards a regenerative system which is aiming to actually improve the resources it uses. Regenerative practices focus primarily on rebuilding soil organic matter and restoring degraded soil biodiversity to improve plant growth, soil fertility, insect and plant diversity and soil carbon sequestration. This not only leads to healthy soils that are capable of producing high quality nutrient dense foods, improved hydrology, and biodiversity, they also have the ability to reverse global warming. 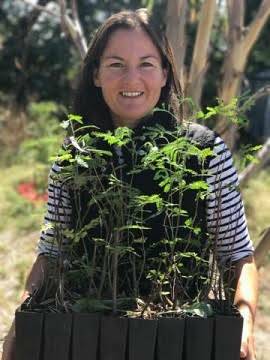 LachLandcare Inc, supporting Yass and Goulburn communities, is here to enable farmers who are wanting to adopt regenerative landscape management practices by connecting people and funding, offering education and by establishing support groups.